Minneapolis, MN—September 1, 2015—Banner Engineering has expanded the maximum sensing range available for the Q3X laser contrast sensor with fixed background suppression. The Q3X now features four standard sensing ranges: 50 mm, 100 mm, 150 mm, 200 mm with fixed background suppression technology, and a 300 mm model which uses standard intensity detection. The key innovation of the Q3X sensor is the combination of low-contrast detection within a defined sensing range. Featuring high-speed part detection as fast as 250 ?s, Banner’s Q3X laser contrast sensor can capture up to 2,000 events per second. This, along with background suppression, makes the Q3X ideal for detecting targets with small contrast changes where a variable background needs to be ignored. “With the extended sensing ranges, out to eight inches, the Q3X sensors with fixed background suppression have the reach to solve many more applications requiring high-speed detection of low contrast differences. Error proofing and registration mark detection applications commonly found in automated assembly and consumer packaging machinery are two of the target applications for the sensor.” said Dennis Smith, Senior Technical Marketing Manager, Banner Engineering. 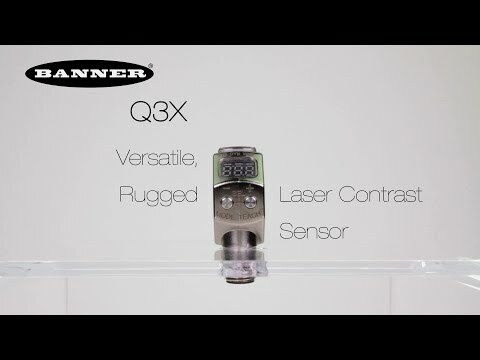 Banner’s Q3X is designed with a unique angled, three-digit display of signal intensity, which provides high visibility of operating conditions from multiple angles. For an intuitive user setup, the Q3X has two tactile buttons conveniently located below the display. The Q3X’s rugged nickel-plated zinc die cast housing ensures reliable performance even in environments with exposure to cutting fluids and oils. Sensors are rated to IP67, IP68 and IP69K for enhanced protection to water submergence and high-pressure washdown environments. The Q3X laser contrast sensor is ideal for a variety of applications, including registration mark detection, leading edge detection, high-speed part detection, small/thin features, part in place verification using small contrast changes, or robust fixed range part detection. With a fast 250 microsecond response speed, a reliable 300 mm detection range, bipolar PNP and NPN outputs and superior ambient light immunity, the Q3X can solve even the most challenging contrast-based, part-detection applications.